Surrounded by sycophants eager to curry favor with the naive new emperor, and overwhelmed by the burdens of his new life, he can trust nobody. Amid the swirl of plots to depose him, offers of arranged marriages, and the specter of the unknown conspirators who lurk in the shadows, he must quickly adjust to life as the Goblin Emperor. All the while, he is alone, and trying to find even a single friend . . . and hoping for the possibility of romance, yet also vigilant against the unseen enemies that threaten him, lest he lose his throne or his life. 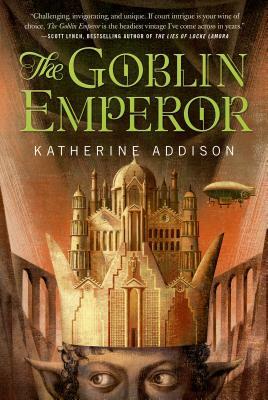 Katherine Addison's "The Goblin Emperor "is an exciting fantasy novel, set against the pageantry and color of a fascinating, unique world, is a memorable debut for a great new talent.